We want to stay connected to nature, but most of us prefer the coziness of our warm homes in the winter months – especially in the coldest areas, such as the North Dakota prairie yours truly inhabits. 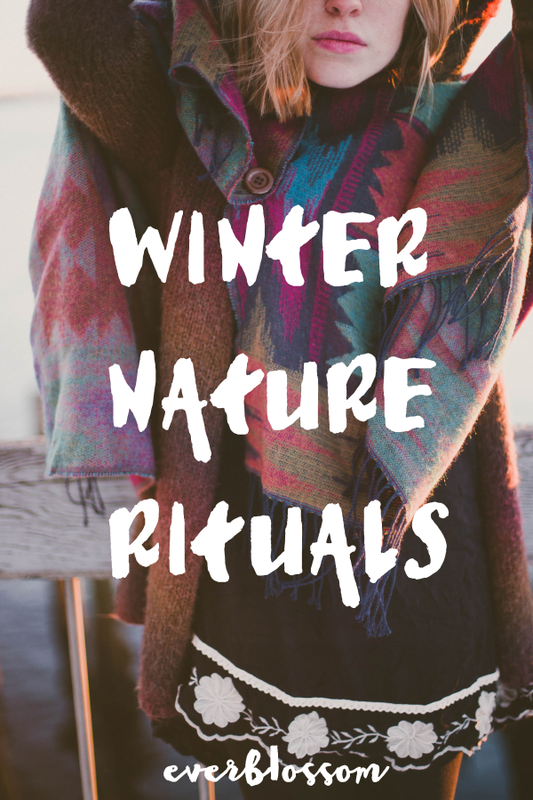 These winter nature rituals can help you reconnect with nature while spending very little or no time outside at all. Track the moon's cycles. All you need is a window and some resources on the phases of the moon. Journaling is an especially helpful way to track how the moon's cycles affect you personally. Care for your body. After all, you are nature, aren't you? Don't neglect your self care: tune in throughout the day and give your body what it needs, whether that's a glass of water, a nap, a round of gentle movement or whatever else. Mindful sun exposure. Light therapy is an option, but can we agree that natural exposure to the actual sun is ideal? Consider what will work best for you, whether that's spending time near a sunny window reading for 20 minutes every day, investing in a UV light. Be mindful about how your devices can affect your circadian rhythm. Eat seasonally. There is a reason we gravitate toward hearty, nourishing soups in the winter time: they offer us what we need where green salads and raw fruits that have been shipped across the country will not. Don't shy away from (quality) canned and frozen produce. Harvest winter herbs. What might the trees in your yard have to offer? What can you find under the snow? By honoring each season, we can learn so much about our world and ourselves. What are your favorite ways to connect with nature during the wintertime? I'm Kylie and I'm obsessed with self care - I've been blogging about it since 2009. Welcome. Grab a cup of tea, slather on a face mask, and settle in. Natural health is about empowerment, not fear. 10 Skills for the Maintenance + Repair of You. This is an interesting article and I will be trying these tips. Very informative – thank you for sharing these awesome tips!